Red charges interest and sends the team after Olivia Olson (Blacklister No. 115). Oliva used to be the It Girl of hostile takeovers on Wall Street, then moved on to helping criminals grow their businesses by identifying and taking over other criminal organizations. She also works with Anna McMahan, but Red isn’t sure what she does for her. That’s not his job, anyway; the Task Force gets to figure that out. What’s in it for Red? Well, Olivia is in many ways his competition, so it would help him out a bit to see her sidelined. However, when Liz and Ressler arrive at the location where Olivia is supposed to meet a new client, they find out the client is Red! He thought he’d offer Olivia a job and see if she’d be interested in sharing information about her work with Anna McMahan in the bargain. Olivia, via computer (she doesn’t do in-person meetings), tells Red that she isn’t interested, so he shuts her down by simply closing the lid of the laptop. Olivia immediately calls Anna and tells her everything. Liz and Ressler try to catch the person who is broadcasting the signal that Olivia is using to chat with Red, but don’t have any luck. Hoping to cause trouble or prevent shenanigans resulting in her name popping up in Olivia’s files, Anna scurries over to the Post Office and demands to know what Cooper and the kids are doing. Red arrives minutes before her and sits down in a comfy chair in Harold’s office to listen as Anna rants a little. She’s disappointed when Harold explains that he was just getting ready to call her about Red’s newest intel after completing the numerous forms she’s provided the Task Force to complete telling her just what he was going to call her about. Anna ignores Red (well, she refers to him as a sociopath), so he asks Anna whether she knows Olivia Olson, just to see what she’ll do. Unfortunately, Anna’s had time to compose herself in the car. Harold tells Anna that the best thing about arresting Olivia will be that they’ll be able to access her files to find out who her clients are and what they’re doing. Then they can make loads of arrests of criminals and miscreants like you, Anna (unspoken)! Red and Harold are both hoping that Olivia will mess up in a way that will get her back on their radar. 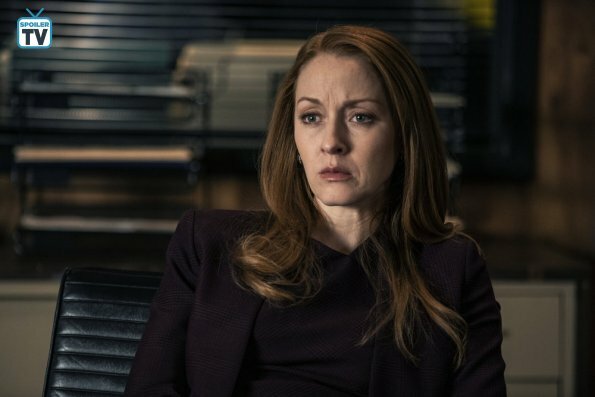 While Aram helps Liz and Ressler sort out the name of a company recently acquired that was most likely a front for her business, Anna meets virtually with her managing staff. She’s looking to discredit a contractor who looks ripe for acquisition. The problem is that he doesn’t seem to have any vices she could capitalize on. However, he did just add a new sky deck on a fancy downtown hotel. Maybe if they sabotage it and make it look like he skimped on materials the contractor in question might be more amenable. And if people have to die then hey, that’s just the cost of doing business. Meanwhile, out in the lobby, Liz, Ressler and a team get to Rain Cloud (a newish company Olivia bought as a cover) and start going though things and questioning people to find out where Olivia happens to be. She’s virtually upstairs, but her Assistant manages to get word to her about the FBI sniffing around. She cancels the meeting and deploys malware that will destroy all of her files so that the FBI won’t be able to use them. They do manage to get some of the data, but there is only one man on the planet able to make sense of it all: Super Aram!! Where is he, anyway? He’s been a busy guy since getting up that morning, starting with embezzling $60 million dollars from Red’s accounts. He doesn’t want the money, he tells Red: just take him to Samar and he’ll give it all back. 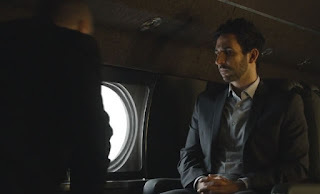 Red knows he’s telling the truth and since he isn’t interested in killing any of the Task Force this week, he and Dembe get in the plane with Aram and away they fly. Aram’s scenes with Red were great; he showed no fear and lets us see how much the character had grown. I think Red knew something like this might happen and was ready to help Aram when the time came. I don’t think he counted on that $60 million, though. As the plant floated along Red kept gently telling Aram what a huge risk he’d be taking by going on the run with Samar, how Samar wanted it this way because she loved him and wanted to spare him pain. Aram didn’t want to hear it, but he needed to. And Red thought he was the only person who could get through to him. 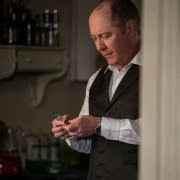 Red gave up everything to run away and become Raymond Reddington, and you no doubt have to let a lot of things go to succeed at that. 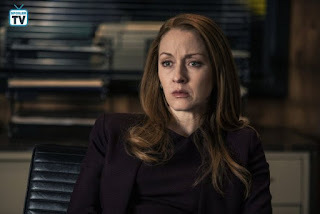 I think what really got to Aram in the end was when Red took the call from Liz about the problems they were having on the case with the servers and there was no way to for Aram to help. That’s one of the worst things about being on the run, Red tells him, that you can’t there for the ones you leave behind. But since the plane hadn’t landed yet and the Mossad weren’t following him straight to Samar, he could still help. Aram sadly agrees and figures out in less than a minute what the data says, then tells Liz that the hotel is where they need to be. And then Aram quietly asks Red to turn the plane around and take them back to DC. Liz, Ressler and a team converge on the hotel, only to find out that they’re minutes too late. The explosion rocks the hotel and some lucky guests manage to get off the sky deck before it collapses, but not all of them are so lucky. Ressler improbably manages to save one women, though; with the strength of one arm he manages to lift her up while she's barely holding onto a piece of rebar. Yes, Ressler, you do curls as the gym. We get it. Outside they find Olivia's Assistant-in-Crime (not the one at Rain Cloud: this is a more of a Dembe-type assistant) who gives her up so easily my cat could get him to talk by just meowling at him, but maybe that’s the plan. Liz and Ressler arrive shortly after Olivia gets away again, but her servers aren’t as lucky this time. They hadn’t had time to cook yet and all of the information is intact. Harold proudly presents the data to Anna, who is pleased about how well they worked together and promises to get her “people” on the people in the files right away. Then she slinks off, thinking she’s won. Which makes me really confused about how far she and her plan have managed to get. Because really, Anna, did you know think that Harold wouldn’t copy the data and let Red know that there was one file she didn’t turn over to be investigated? It’s called the Third Estate, which translates loosely to “the 99%”. Whatever could that mean? Well, Episode 17 is called “The Third Estate”, so maybe we’ll find out then. I’m surprised Red didn’t congratulate Aram on how he “borrowed” Red’s money, it was a good trick. Wonder if Red’s really going to make Aram pay the interest? Liz’s manipulation of Ressler continues. Are you sure you don’t want to know what happened to your mother? Yes, I’m sure. Does anyone think that she really doesn’t care and isn’t trying to get Ressler to do her bidding? Because if so, I’d like to hear about it. Loved the way Aram sat down in front of a MossadCam in his living room and telling them that he’ll never let them know where Samar is hiding. Teary moment! Still not sure what’s wrong with Red but he continued to hide his illness from Liz. Aram saw that he was in some obvious pain on the plane, though. Wonder whether he’ll ask Liz about it.